The Ruger AR-556 MPR is a great choice for an affordable, made in USA, modern sporting rifle. The AR-556 MPR combines the Ruger Elite 452 AR Trigger with a Magpul 30 round magazine, and Magpul collapsible stock, grip, and attachment slots to make it your own. I bought this gun on a recommendation from a friend. Great initial platform upgradeable to the nth degree. I did research. This AR is a great entry level choice. It's a Ruger and it has a 18 inch barrel. If you read the product details. Review articles written and read reviews. This Ruger is a good bang for the Bucks. Ruger has made a competitive priced package with the MPR. 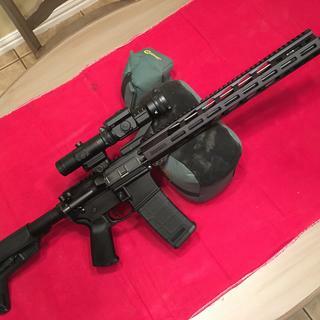 Solid rifle by a good company, USA made. Excellent ruger quality. Excellent customer service from grab a gun. Highly recommend this gun and retailer. It's almost exactly what I would build if I were to buy one component at a time for a lot less money. And you can't go wrong with a Ruger!! Great brand with Ruger. Many fine reviews. Also has the accessories that I was looking for at a good price. Great reviews on the rifle and Grabagun's price and service are hard to beat! Outstanding rifle for the price. Its what I wanted and the price was right. GrabAGun gets it done! Best prices and speedy service. I chose a ruger because of it’s reliability in other firearms I’ve used and couldn’t beat the price. I chose this because I trust Ruger firearms. They work well and are reasonably priced. The ugraded trigger and barrel make this an exception value in price. Initially, I wanted the Ruger AR-556. 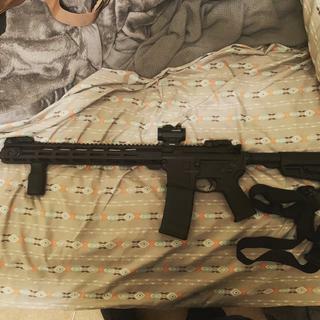 For $100 more, I saw the MPR version -- which has a 2" longer barrel, longer gas system, a free floating hand guard with M-Lok, much better trigger, Magpul furniture, and a flat top upper receiver. It doesn't come with sights, but that's a good thing to me. I don't like how tall & large regular sites are. If you bother to look @ any one of these options to switch on the original AR-556 , you'd see that the $100 upgrade price is well worth it for all of them! 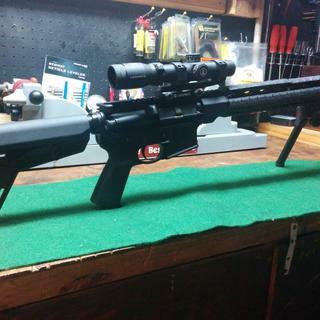 Ruger is a good name in firearms, the reviews were good, price was low and the longer 18" and magpul. 5 Star reviews and good price. did my research for a first time ar buyer. it came between the ruger ar 556mpr or the Springfield saint edge. both had great reviews, so it just came down to price. GrabAGun has the best price on this item. Looking forward to shooting this rifle! Best gun for the money out there. The trigger alone is worth the extra cost over the standard ar-15. BEST ANSWER: In my state we can’t hunt deer with this rifle but my sons both took hogs in Texas with them. We’ve killed numerous coyotes with them. I’m fully confident if your state will allow you to hunt deer with one of these rifles with a good soft point and good shot placement you won’t have any trouble taking a deer out to about 300 yards. Yes and no just depends on the size of the deer. The hogs you should be okay the deer I think you might need something a little more powerful. You could also go with a higher grain bullet that should help. 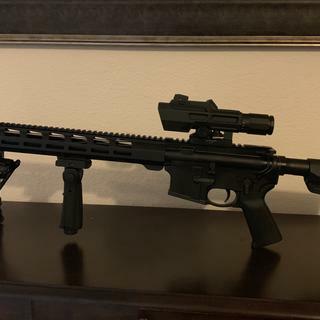 This purchase if you make it would be a great one, from the free float rail to the 2 stage trigger and all the magpul furniture it’s ready right out of the box! I personally believe the 5.56 and .223 are not suitable for hogs or deer. 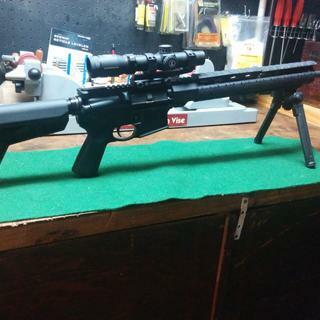 If you are looking for a rifle in an AR platform for hogs and deer look at the AR10 in .308 or 6.8 6.5. Although the MPR is a FANTASTIC rifle for Coyotes. The MPR has proven to be very accurate and shoots well without any problems. It depends on your state, it's legal in minnesota to hunt deer with the 5.56/.223, but I wouldn't recommend it, it would take a really well placed shot to take them down ethically. On the other hand I would have no problem using this for hogs. You will have to check your state laws to see if they allow a caliber this small for hunting large game. It will kill them but you would be well served to use a larger caliber. But it is a great gun to own. Very good price. Without a doubt... but check your local laws..
As always caliber and manufacturer are not as important as shot placement. Will take down large deer. It is a good rifle for whitetail deer. I use 5.56x45mm Winchester Match 77gr. HPBT ammo in my rifle and it will drop deer. 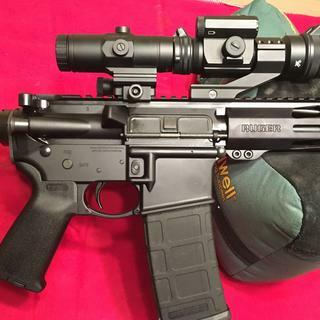 Does this work with the magpul mbus sights? Yes. It will work with any sight with picatinny mount. The rail is lightweight though. It has some flex to it. Should still work fine for most use. Yes. You can attach them to the picatinny rail on the top very easily. It should, I have Magpul canted on mine with a Burris scope. Yes. I have a pair on mine. 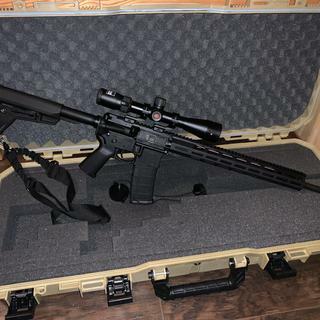 Does this Ruger MPR 556 rifle come with a case or bag? BEST ANSWER: At the time I purchased mine it came boxed without a case. Great gun and shoots very good. No, it just comes in the shipping box. I was initially interested in the AR-556, but I wanted all of the upgrades that the AR-556 MPR comes with. It seems that any one of these upgrades can justify the approximate $100 increase (upgraded trigger system, magpul furniture, floating rail/handgaurd, & 18" barrel. This makes the Ruger AR-556 MPR very competitively priced & a high value. I took it out to the outdoor range for the first time last weekend. 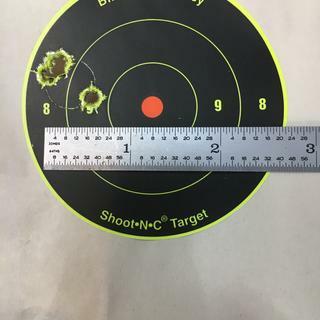 I like the way it feels, but at this time I cannot confirm the accuracy from 50 yards. 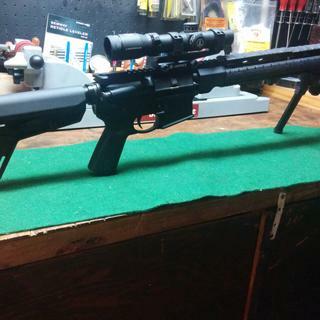 I do not think this a rifle issue, I believe my red dot was not properly calibrated. Also, I had two occurrences where the ammo did not eject properly. I did not clean the rifle after receiving it. 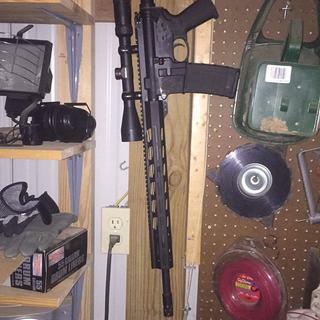 I will clean it and update you after I take it back out to the range. It's a keeper! Great choice! Very nice trigger! Trigger is definite upgrade from most basic AR's. Shoots good right out of the box with factory ammo. I tried Brand Name stuff from 55 to 69gr. shot fine. 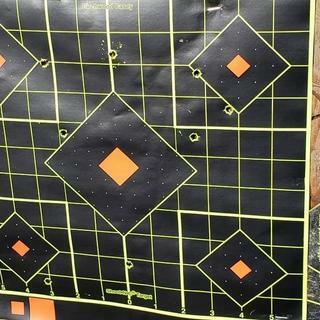 With a Leupold Scope and sand bags produced nickle groups at 100 yards. Haven't tried the cheap cheap stuff and probably won't. But several basic brands and bullet weights shot good and didn't seem to be all that finicky. No fails of any kind. Very well made and balanced weapon. Shoots very well and is very accurate. Great gun, put about 200 rounds through it without an issue. Extremely accurate and has a very smooth trigger. I have been thinking about getting an AR15 for a while and did a bunch of research from different on-line sites on AR15s in 223. The Ruger MPR seemed to have the best options and price point. You can pay less and can pay a lot more and this was where I wanted to be for features vs price. It is an awesome gun, very well made and very nice to shoot. GrabAGun was excellent to deal with. The way things should be. Shoots perfect, looks amazing, got it in under a week at a good price, thank you grabagun! I was looking at building a rifle length AR piece by piece to shoot woodchucks and coyotes that would have ended up looking pretty much identical to this Ruger MPR. And having never built one before, by the time I had the necessary tools and all individual parts I would have had much more than $600 into the project so long story short this was a no brainier especially for my first AR. Love the rifle and the service at GrabAGun is awesome as well. Thirtieth, thirty-first, thirty-second rounds through the rifle. One hundred yards. Round count is now about on-fifty. No failures. Any questions? The rifle arrived just as advertised. I have only been able to put about 250 rounds through it, no misfeeds, shoots true. Great gun for the price! This is a great Rifle. Just love Ruger quality. Grab A Gun got it to my FFL within a couple days. Added new Magpul sights and I was plinking steel targets consistently after 5 rounds. Not a single jam or misfire after putting 300 rounds thru it. Lots of choices out there for AR rifles. I highly recommend this one. Gonna need more ammo from Grab A Gun. Everything you need to know is in the name, Multi Purpose Rifle! Great rifle, above standard features at a great price. The upgraded trigger and soft recoil make follow up shots quick and on point. The M-lok hand gaurd gives great feel right out the box or alot of real estate for accessories. Really nice rifle for the money, can't go wrong buying one of these. From getting qualified for a credit purchase to telephone customer service it was an easy experience. I was able to select from an overwhelming number of handguns and rifles on a well designed website. Unfortunately for my wife it is too easy for me to support my hobby. Will say, buy the Springfield XDe for the extra magazines and overall price not the case and holster. Mix up with FFLs delayed the shipment. This was my fault. First time online buyers please contact the FFL before selecting it. I received my firearm today in original box. Box was not damaged and the firearm was flawless. I couldn't be happier with it. I would pay over a grand for this in a store. I would like to personally thank GrabAGun and support staff for their assistance. I am very pleased with the purchase. Thanks again! Guy and Gals! If you want a reliable,accurate and easy shooting rifle here it is and plenty of space to put accessories on. I'm really enjoying this rifle. I've been surprised as to its accuracy and just sheer fun it is to shoot. I do advise applying more oil to everything that moves before going to shoot. It wasn't feeding properly on my first outing until I applied more oil. Go ahead and buy one. Both the MPR and Grab-a-Gun exceeded expectations. Less than five days in transit. Well packed. The MPR is great with no problems in two outings so far. Descent rifle for the money. I have a Ruger 556 and us s pretty good rifle, so I decided to take a chance on the MPR despite all the internet chatter about magazine problems with the hin. Have put a few rounds through the MPR, I can say I haven't had any feeding or reliability issues. However, the bolt does fail to lock open after the last round intermittently. Not a big concern for what I am using for, but disappointed it doesnt work properly, especially since my 556 functions flawlessly. Some areas of fit are a bit sharp. The point of connection of M-Lok Handguard forend and receiver has an edge that appears to be a little off alignment. Haven't had a chance to shoot the rifle to see if this will affect or make the alignment of rear and front sights off center. I’m so satisfied from my purchasing experience with GrabAgun, I got exactly what I ordered and in short time. The service is amazing and the prices are very affordable. Thr ruger mpr is a great shooter east to handle and very accurate I've killed a hog at 50 yards and my daughter killed her first coyote at 100. The only thing that I do not like is the muzzle break very loud but expected, set of ear plugs an your good to go. Just as advertised. It’s a nail driver that my 6 year old to get behind and never think about a kick. The break on it takes away almost all recoil but certainly makes for a loud 5.56. Really impressed for the money, will purchase another soon before price goes up, thanks grab a gun ,quick shipping. Love this gun. Can’t beat it for the price. Some misfeed issues out of the box but extra lubrication might have solved it. Love this gun. Can’t beat it for the price. Working through some misfeed issues but may have solved. I absolutely love this weapon! You cannot beat this AR for the price and features! I've put 1000 rds through it in 2 weeks and it has been flawless, the trigger is light and very responsive! Hitting steel @ 500 yds is a breeze. Very high quality, made in the USA, you can't go wrong with this Gun. I highly recommend this to anyone in the market, you will not be disappointed! Thanks Grab a Gun for the great price and fast shipping! 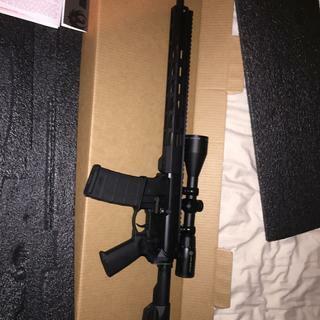 Purchased this as a first rifle. Has been great so far. Only two took days from date of purchase to arrive at my local FFL. Came soaked in grease (which is much better than bone dry IMO) and after firing about 300 rounds of Winchester 55gr 5.56 have had no feed or ejection issues. Magpul furniture is great as I expected. No issues thus far. Great build for the $$. 452 trigger is crisp and breaks somewhere between 3.5 and 4lbs. 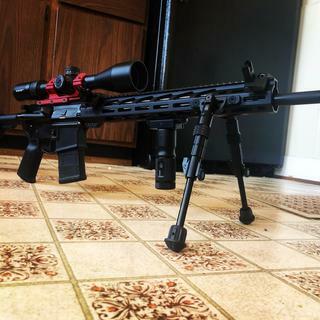 Very similar feel to a timney i have on another rifle set at 2.5lbs. I dont like 2 stage but this triggers first stage is very short which makes it ok.
Good quality feel before shooting I gave it s good cleaning. I’ve run a couple hundred rounds of federal thru it, it runs really nice. Grab a gun is a great store to work with and prices can’t be beating. Sweet shooting rig. Super light, no recoil, and very accurate. easy transaction....first trip to the range....sweet shooter! I just at red Dot and muzzle brake and I love it. Great value. Great starter AR that comes with some nice upgrades out of the box. Love the Ruger 5.56!! Customizable, easy to clean, ease of use, handling! It is truest one of the best long guns I have owned! Very pleased with this Ruger MPR. Purchase through grabagun was seamless. Great gun for the price. If your looking for a solid base gun to start with, this would be it. Great gun, just like all rivers. Grab a gun was excellent as always. The Ruger AR-556 MPR is a distinct combination of Ruger innovation and Magpul furniture. The Ruger AR-556 MPR provides you with an exceptional value that can't be overlooked. All backed by an amazing Ruger warranty which is second to none in the industry. The AR-556 MPR features a 15" Free Float M-LOK compatible hand guard along with a Magpul MOE SL Stock and MOE SL Pistol Grip. The barrel is an 18" 4140 Chrome-moly steel barrel which has been cold hammer forged and features a 1:8" right hand twist rate. Features a rifle-length gas system along with a pair of forged 7075-T6 aluminum upper/lower receivers.